Recently I was awarded the Stylish blogger Award by Ada, from Classiq. Hereby I want to give her a big thank you! Her blog is of great consistent quality, existing of timeless beauty, inspiring movies and moving words. Receiving this award means you have to share 7 things about yourself and pass the award on to 10 other bloggers. As I love making moodboards and it had been a while since I made one, I decided to spent some time in Photoshop to tell and show you a few personal things. This is what I call receiving stylish award with style ;-) Love your hat; you look fabulous with it. And you so deserve the award. 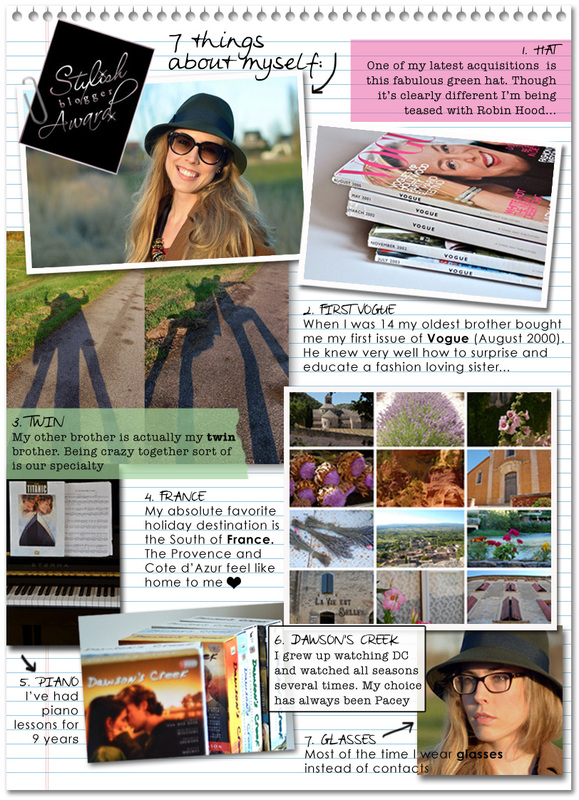 Christel, this mood board is such a great way to get to know you better! I need/want to learn Photoshop - I think I would have a lot of fun with it. Congratulations on being recognized for your work! You know I'm a fan. And, so happy to learn about some of the blogs you like. Hopefully this weekend, I'll get to peruse them all! Congratulations on the award! I enjoy how you've put this together... some new things learned that I didn't know about you included. Love that your brother bought you your first copy of Vogue—how thoughtful of him! Happy St.Patrick's Day to you—have a lovely one. Congratulations you totally deserve it and the stylish blogger award couldn't fit anyone better! Congratulations,dear! You earned this award! I like your blog so much,so I'm happy for you! And,I must say,you did a great job with this moodboard (I would never be able do such thing) ;) Kisses! congrats - very much deserved! and thanks so much for the award, christel! loved reading your facts. have a great day! Oh my goodness, someone who loved Dawson's Creek! Yes, it was always Pacey for me as well.